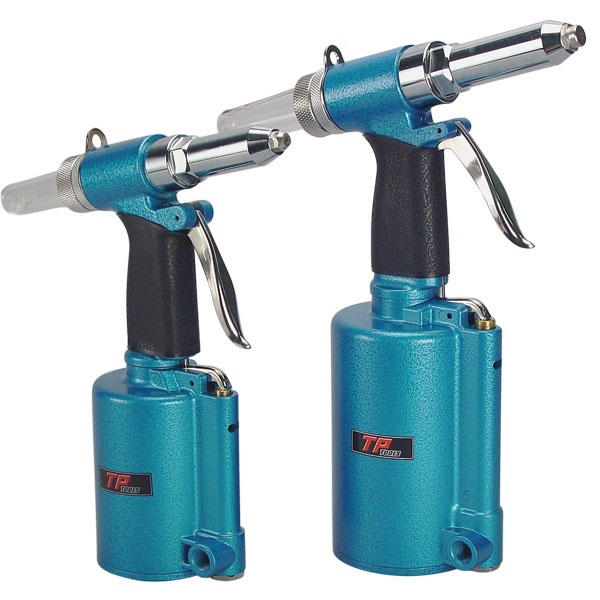 Tired of sore wrists from manual rivet guns? Try this! Great for any riveting job - duct work, aluminum, fiberglass, siding and automotive applications. Riveters require 4 cfm @ 90 psi. TP-3050 Standard Riveter - with 3/32", 1/8", 5/32", and 3/16" nosepieces. 3-1/8" wide, 10-7/8" high, 9" long. TP-3051 Heavy-Duty Riveter - with 3/32", 1/8", 5/32", 3/16", 7/32" and 1/4" nosepieces. 7" wide, 12" high, 13-1/2" long.